Wholly Family!- The Holy Family. Sunday December 30, 2012. When I talk to people about God, it isn’t what I say that they pay attention to, it is what I do. Do I talk about loving the unlovable, but only love the lovable? Do I talk about forgiveness, but hold grudges in my heart? The way we live our lives makes a difference in how people understand those ideas and so much more. We make God real when we demonstrate love to the unlovable. When we forgive someone, they can start to believe that God can forgive them, too. Skin Ministries is about helping people put ‘skin’ on their faith. 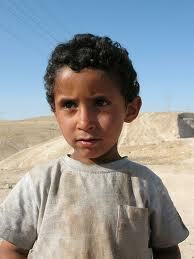 A Palestinian Boy, with the same skin-colour as Jesus,- as God! Family, and think of Jesus growing up in Nazareth with Mary and Joseph, maybe we could look at them as ‘Wholly Family’! Not wooly, but wholly! In other words, they all got stuck in to being together, looking out for one another, caring, wiping tears, cleaning the house, preparing the food, doing the daily work, having plenty of laughs and of fun, going for walks, giving little Jesus the ‘UpsyDaisy’ treatment, as they swung him between them as they walked along. They were very ordinary, and very human. Jesus has skin on him, and so had Mary and Joseph. And Jesus of Nazareth was and is ‘God with skin on him’. That’s what the word Incarnation means,- ’in flesh’,- having skin and bones and blood and flesh and breath. They were wholly human, and, like every other human on the planet, immensely sacred and precious. And being Wholly Family means being Wholly Neighbours as well. That’s what we all need in our country at this time,- to be wholly for people, like Jesus,- to let God have skin in us!